I remember the one on here that was practically verbatim, and the subsequent beatdown from you and others before the thread was locked down. I'd never seen something so brazen before. It was so peculiar that I wasn't even outraged, I was just confused. As someone who has been giving Downix feedback , reviews, and advice, I feel somewhat responsible for some of this, and as such, feel I should throw in my two cents. When I initially read the draft of this fic, I hadn't read MTtB - I had no reason to think it would be necessary, and little time to justify reading the entire thing at the time. Since then, I have begun reading MTtB, and I will grant that the similarities between the two works are significantly more than incidental, and more than I personally would be comfortable with. Had I had that familiarity with MTtB, I would have strongly recommended more effort be taken to differentiate the two. Between his two publications here ("Within a Looking Glass" and "When The Puddles Dry") and unpublished works I've read, it seems very evident that Downix had no intention to pass Leaty's work off as his own. Rather, it appears to me that what we have here is really a fanfic of a fanfic. Very much like what MTtB did with the original KS scenes, Downix seems to have done with MTtB. Frankly, I'm not 100% where I come down on this, other than that I wouldn't be likely to do it myself. That being said, what is being lifted from MTtB vs what isn't? Mostly, to be frank, it's irrelevant set dressing - some degree of basic background information, certain clips of dialogue, etc. As I said, very much like MTtB's lifting from KS. But what's different? Right off the bat, the Iwanakos are pretty dramatically different, as is half of the supporting cast. Some story beats are quite similar, but many of those tie back to the logical extension of what would happen in relation to the common KS root (e.g., similar physical impact from Emi running into Iwanako). However, I feel it important to note my understanding that Downix sent Leaty a PM about this fic back in February or March, and proceeded to sit on this project for several months, until July. After 4-5 months without a response, I find it somewhat indefensible to condemn him for using his own judgment. In my opinion, if, over the course of four months, you can't be bothered to reply with a "hey, I'm alive, but busy. Let me get back to you when things calm down", you don't get to be indignant when he moves forward on the assumption that you don't care enough to give input on how your work is used. If you're less than happy with how the fic was presented or contextualized, a quick "Hey, I'd appreciate it if you gave me some co-writing credit" or "Hey, this seems like it's more than just an incidental similarity between our works; would you mind being a little more clear about their relationship?" would probably be ideal. He initially approached with deference, and gave you plenty of time to respond. Saying "This is the third time my work was stolen" ignores the fact that you were contacted for your input, misrepresents the degree of effort to differentiate the works in order to create something new, and generally throws the conversation into an unnecessarily adversarial tenor from the get-go. Frankly, I would suggest Downix and Leaty discuss the matter through PMs or some other medium, figure out some mutually agreeable resolution, and quietly implement it. As it is, the accusations and recriminations cast both fics in a negative light. We don't need that kind of drama here. So, I wrote an Act 2, then realized it was trash so started over. I still haven't finished, but the first third seems to be ready, so I'll start putting it here in pieces over the next week or so. The alarm breaks me out of slumber. Tired, I blearily look around. Monday, once again. But today, it feels a bit darker. Today is the first Monday where I no longer hope he would return. I now knew that prayer and wishing was all for nothing. Putting on my uniform, the tired black and burgundy I’ve worn for years, I glance at my mirror. Hair, that uniform dark purple it has been since that disastrous attempt at dying it years ago. Not bothering to style it, or even apply makeup, I sit down at my desk. It’s over, but not how I’d longed for. Glancing at my phone, I re-read the message from his mother. He was released from the hospital, and will not be returning to our school. Instead, he is going far away. Looking up the information on his new school yesterday didn’t help. If anything, it fueled that dream. It was so vivid. Remembering him laying there in a hospital, becoming ever more remote, tore my heart out. I couldn’t see him like that anymore. I hoped when he got out I could make it up to him. But now, even that hope is gone. Glancing at my tear stained pillow, I know that there is only one thing left that I can do for him. I have to let him go, for both our sake. Sitting down, I pick up my calligraphy nib, dip it in the blush ink, the same inkwell I’d used all those months before, and start to write. With a start I wake up in a panic. Grasping around, it takes a few tries to find and turn on a light, revealing my dorm room. I glance around, trying to make sense of it, but when my eyes settle on the white and green uniform hanging on the closet door, I finally let myself relax. “Oh, thank you,” I say to noone in particular. The empty room stands a mute witness to my moment of fear. One thing is for certain, that is the last time I eat crackers and brie before bed. Picking up the spotted thing Hisao gave me yesterday, I take a moment to reflect on what happened last night as I turn it over in my hands. He was here. He came for me. Fireworks on the roof. It was all as if something out of a romance novel. Something my mother always told me was what every girl wanted. Why then am I not happy? Instead, all I feel this morning is guilt. I can’t turn him away, not after he came all the way up here. But what does he want from me? And what do I want? When I saw him off with mother, he took me in his arms and hugged me gently. Now I find myself torn. For all of my talk, every promise I made myself, when facing him, I just can not hold that resolve. “Iwanako, you’re a sap,” I tell myself again, staring at the blankness which is my ceiling. Glancing down, I realize that I still a holding that odd cow-dog-thing Hisao had won at the festival. Rolling out of bed and setting my newly named oddity next to my pillow, I begin the morning preparations. I need to talk to someone. A glance to my bathroom door, and it is clear that someone cannot be Rika. There is only one person I know who would be up this early. And knowing her, she will have a price to pay for talking. Putting on the gym clothes I’d set aside, I head down to the track. For once I am alone down here. Every other time I’ve been here, that bundle of giggling energy is bolting around the track. The lack of the sound of artificial feet hitting the rubberized pavement makes it all feel… wrong. But, the sun is there, just behind the trees, the reds and purples backfilling them as if the edge of the world was filled with a cacophony of color. I can almost hear the sun rise, as the birds awaken from their slumber and the insects quiet down. “Iwanako? What are you doing here?” comes the high pitched voice of the fastest thing on no legs. “Well, I’m about to do my morning routine… And the nurse cleared you. So, if you want to talk, you gotta run.” She says, putting her hands on her hips while putting on that too-cute-to-take-seriously stern face of hers. “And what makes you think I can?” I ask her, half-jokingly. And with Emi’s smile, the sun became the second brightest object I’d seen this morning. Where does she keep that restless spirit and seemingly infinite energy? In an instant, my habit of returning the smile settles in. It takes a moment before I realize it. Still, it is genuinely felt. “Of course,” I tell Emi, starting my own stretching routine. Now, when two girls are competitive by nature, they can compete over anything. Somehow, my stretching seemed to tickle that competitive streak in Emi, as I noticed she began going for ever deeper, and longer, stretches. “All stretched? Come on!” Emi does not even wait for an answer, bolting onto the track as quick as lightning. Taking one step before the other, nervously. I step onto the track. Lifting my eyes from my feet, I see Emi shrinking as she leaves me behind – while running backwards. I actually laugh to myself as I start to move forward on the track. “I… pant… thought… pant… we… pant… were...” I get out before finally running out of breath. And then she turns around, and starts sprinting. My goodness she is a bolt of strawberry scented lightning. As I start to walk, I observe, and there’s that look on her face again – that grim determination of hers plastered on for all to see. As I finish my walking lap, she seems to finish her sprints, and slow down to join me at this leisurely pace. Her hands behind her head, it amuses me to realize that sweat has revealed she’s wearing a black sports bra. Then the thought strikes me. Glancing down, yes, the blue of my own is shining through my shirt as well. I chuckle a bit. When I realize I’m still walking alongside her, despite having finished my own cooldown. It is as good time to talk as any. 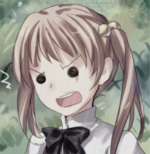 “So, um… about Hisao…” I say. “Why are you still on about that? I mean, the guy traveled hundreds of kilometers just to see you. It’s not like you dislike him either. You’re just being stubborn,” she snaps back at me. “Deserve? And since when are you an expert on who deserves what, anyways? Don’t you deserve some happiness too?” Emi scolds, giving me an annoyed expression. Finishing her walking lap, with a single move Emi turns around and glares at me. Having said that, I see Emi’s smile return. She releases my shoulders with a firm clap. Walking up to the administrative building, I check my heart. Due to the running it feels a bit fast, but not incredibly so. I smile to myself, knowing that I am not so physically limited as I’d once feared. “Right!” the small bundle of energy exclaims before opening the door and rushing in. While Emi is in with the nurse, I wait outside in the hallway. Keeping my eyes away from the neatly arranged fliers set out, I look over the rooms across the hall. They’re unmarked, but look to be some kind of therapy or exam rooms. “Your turn!” comes the voice of the fastest thing on no legs as she sprints out the door. I only barely see the blur as it exits the building. Shaking my head in disbelief after witnessing Emi once more running in the building, I step into the office. “Good morning, I heard from Emi that you joined her this morning,” the nurse says, a knowing half-smile already on his face. The office does not change from day to day. I wonder for a moment how the nurse works so hard for keeping me and my fellow classmates together. Thankfully the gym shirt is easy to take off. Standing up straight, I wait as he takes out the rather long and thin device and waves it over my pacemaker’s scar. A little chirp is the only indication telling us that it’s collected the data. As he sits down in front of his computer, he gestures to a chair, saying, “Take a seat while I pull this up.” The computer whizzes and churns as computers do while he moves the strange little thing on his desk, making odd clicking sounds. A minute later, this weird chart appears on his screen, looking like the stock chart my father used to watch on television during dinner. The nurse’s eyes wander over it as he makes interested noises. He picks up a mechanical pencil, and with the eraser, he circles around a spike on the chart. “So, can you tell me what you did yesterday to cause your heartbeat to spike?” He taps on the peak as he speaks. He makes a few non-committal noises before coming to some conclusion. He backs away from his monitor, forcing me to move my head to keep him in sight. When he’s sitting back, that grin of his reappears. “It looks good Iwanaga. Just try and not run away from boys next time,” he says with a wink. I can only give him a level look to express my disbelief. Rolling my eyes, I still cannot help but smile at that. Back in my room, the silence next door tells me that Rika has not come back from the pool yet. Good time to get ready. The dream running in the back of my head, I take that little extra care on my appearance. No, I must not let myself fall to that point, ever. I refuse. Even if I have a literal broken heart, the world will not see the pain. I must carry on, no matter what. A few twists, and I make a ring braid around the back of my head, with a ponytail hanging from the center. Today I will use a full jewelry setup, some perfume, and subtle makeup. I must look my best. I must not fall to that fragile, broken figure. I must endure. Reaching the classroom with only a few minutes to spare, thankfully it seems I’m not the last one to make it. Gliding to my seat, two sets of eyes seem to be following me. Guess it’s time to deal with rumor control. “Good morning,” I tell Misha and Shizune, waving to help the latter know what I said. “Hi Iwachan! How are you feeling?” Misha pipes up, a little softer than her usual tone. At this, Shizune gets an odd glint in her eye and a sharp smile. At that moment Mutou makes his entrance, halting what was likely going to be a recruitment pitch. Never before in my life had I felt so happy to see a science teacher. It’s not that I dislike Shizune and Misha, but I’m not really student council material. Glancing back, the lack of Hanako is expected. Instead, I find her sitting there sitting up, her hands down on the table, folded together while she looks at Mutou at the front of the class. I hope I didn’t scare her too much yesterday. As I turn my head to look back to Mutou, my eyes notice someone gazing in my direction. With a sense of irritation I shove Maeda out of my awareness, and shift my seat slightly to put Shizune and Misha in between us. Tuning in Mutou, I prepare for a long class ahead. Seriously, a test, the day after a festival? Who does that? By lunchtime my brain felt as if it had gone through an industrial cheese grater. How Hisao makes sense of any of this is beyond me. “Iwacchan…” Misha says in a remarkably playful voice. When Misha’s voice stops suddenly, I’m surprised. Glancing up I can’t help but be surprised as I see Maeda standing there. He is looking in Shizune’s direction, with his hands up… and signing to the two of them. Shizune’s hands go into motion, directly to Maeda. He takes a quick glance in my direction, then seemingly puts me out of mind while they… sign to each other I suppose is the right term. When I hear Misha say, “But what about me?” I realize that she’s now become redundant to the conversation. That must be unusual for her. Considering, I don’t think I’ve seen them apart at all last week but that moment at the dorms. I wonder what Misha’s like when she is not serving as Shizune’s voice? Clearly Shizune and Maeda don’t need Misha to talk about, well, whatever they’re talking about. A moment of curiosity passes my mind, but quickly is shoved aside as I look at Misha sitting there, a melancholic expression now affixed in place. Still, nobody deserves to be left alone. “Misha?” I ask. “So how was your first week, Iwacchan?” Misha queries, already eating her sandwiches. Misha expression takes on a sour look. “Well, that’s not nice of her,” she says. “Do you still like him?” she asks, leaning forward slightly. Without Shizune there, Misha is a completely different person. Much more chatty. I like this Misha. It takes a few moments before she looks down at our hands and jumping back, blushing. I consider her situation a moment. “Well, you do spend most of your time with Shizune, so I guess it makes sense you wouldn’t have time for anyone,” I settle on. “Stop it,” I tell her. Without stopping to think I get up and move over to the other side of the table. Not saying anything I put an arm over her shoulder and squeeze her close. She freezes for a few moments before relaxing and leaning onto me. With her leaning in, I move my other arm around her, holding her… The same way Hisao held me… The way you hold someone who is upset. Closing my eyes, a bit of my confusion passes. “Thank you Misha,” I tell her. This makes her sit up, looking confused. “F-for what?” she says, acting a bit flustered. Last edited by Downix on Tue Jan 15, 2019 1:59 am, edited 1 time in total. Class ends once more, and I can only consider last weeks work which I still have to do. I sigh, not wanting to move yet, because moving means work. Finally I resolve to get going, and stand up, resolving to go right to my dorm room and finish my homework. Which means when a figure moves to intercept me as I exit, I find it highly irritating. “What do you want Maeda?” I snap at the boy standing there. “Wanted what?” I interrupt, keeping a knifes edge in my words. Not having thought of it beforehand, I find myself left with no answer. Last week I was there because I did not want to be alone after finding a friendly face. I never considered if I would ever go again. I stand there, staring after him. Is he for real? Turning this idea over in my head, should I go? Should I not? What would I accomplish if I went? Glancing around, I’m alone in the room. Taking the seat I was in last week, it dawns on me that I’ve somehow wound up joining the art club. I snicker to myself. Nomyia is already there this time, sitting in the corner of the room. “Hey roomie,” comes that familiar voice. “Ugh,” she says, sitting up as our third musketeer arrives. “Wow, that stinks,” Saki says, sitting down in her spot from last week, propping her cane up against the table. I glance around, to find Rin sitting in the same spot as last week, gazing out the window. I wonder if that is where she usually sits. “Hello Rin, whats new?” I ask, putting a smile into my voice..
“My face itches and Emi made a new kind of curry today,” she says, not looking in my direction. “How interesting,” is my reply, trying to keep it social. Rin just shrugs, continuing to look out the window. I suppose our conversation is at an end. A general silence crosses the room. “And helped fill in at the goldfish booth,” Saki continues. Sighing, I am about to protest when a voice I would never have expected pipes up. “You helped me with the mural,” Rin says, still not looking in the room, clouds dancing across her eyes. She sets the scroll down and unrolls it in front of me, holding a calligraphy brush out to me. As she steps away, Nomiya walks over to stand behind his desk in three long strides, then gives a smile and a flamboyant greeting. “Good afternoon, everyone! First things first: has everyone met Nanako? She was here last week, and is a new member, so everyone get along with her.” He winks at me, which is rather unsettling. All eight members of the club, including myself, answer his greeting with considerably less enthusiasm. Yet, despite the lack of enthusiasm, the other students do finally straighten up in their seats, turning their attention to the teacher. Why the teacher? Shouldn’t the club president be running things? Or is Nomiya using the club as his own little expression? I’ve seen clubs like that before, and they’re never fun in the long term. All around us, I find people pairing up. Glancing at my hallmates, I find both Saki and Rika looking at me. “Sounds like a plan,” Saki says, pushing herself to her feet. Picking up her cane, she starts the move around the table. “I don’t want to disturb the way things work around here,” I tell her, worried now. Nodding, I tell them, “Yes, I’m fine,” as I shuffle down to sit at the end of the table. “I was going to ask if you wanted to partner up, as we are the only two without a partner,” I hear to my right, making me immediately groan at the lot fate has thrown me. Knowing that voice, I sigh, and look over. “Of course we are,” I tell Maeda, sighing as I stand up. “I’ll go get the supplies. Wait here,” I order him. He holds up his hands to help pacify me. It doesn’t work. Sighing, I sit back down, set out the supplies, and look at the beret wearing boy across from me, putting on the best smile I can for him. He may be a jerk, but that does not excuse impropriety on my part. “Any preference?” I ask, really not liking his attitude. My eyes, huh? I consider a moment, then think back to my flowers back in my room, and the little pleasure I feel every evening when I water them. I fold my hands in my lap, sit up straight, and put on a polite smile. I want to be a lady when posing, after all. He takes a few moments to glance over me before beginning to move his brush, in a painfully slow manner I notice. As he drags it out, I start to feel ever more frustration. Is he trying to annoy me? His eyes are more cold than they were before, like he’s putting all of his attention into his work. When he finishes his outlines, Maeda sets down his brush, and stands up, stretching before standing still. His eyes do not move, staying focused on me. Dispassionately, in the back of my mind I recall that supposedly a standing subject is easier to paint. “Are you making an assumption of my skill, Maeda?” I ask him while working on my lines. Considering, I suppose he may be telling the truth. Or, he may be trying to gain sympathy. Either way… what is his game? When he takes his hat off, it becomes obvious that that a quarter of his hair, the area around his right ear, has been shaved off. What I’d taken as a small bandage next to his ear was revealed to be attached to a larger one wrapped around his head, holding a thick pad over his ear, covering it entirely. When he fails to respond, something clicks in the back of my head. Still, I finish my lines more rapidly than he did, using a thin calligraphy brush. When done, he puts his beret back on and sits down. Fortunately we are using India ink, something I am quite familiar with. It is not the blush ink I prefer to use, but it’s still familiar. “Very good! Standing figure is easier for a beginner to get a grasp of,” comes the teachers voice behind me. I was so absorbed I failed to notice his approach. Maeda rolls his eyes behind Nomiya’s back. I doubt the teacher even even notices him, and moves on to Saki and Rika. “Are you enjoying yourself?” Maeda asks out of the blue. “And I am having fun. It is admittedly a little strange. I never have actually painted someone before,” I answer back, not looking at him, but keeping the paper from obscuring my mouth. “That is so unfair,” he says, before sighing. “I just want you to work from an accurate idea of who I am, that’s all,” he says, tilting his head slightly. I sit there in silence, working on my piece. After a few minutes, I feel the need to tell him something honest. “I am going to have dinner with my hallmates then finish my make up work from last week,” I finally admit. “I’m fine,” I tell him sharply. My eyes flick up to glare at him. “I won’t.” It then dawns on me that he is getting under my skin. My language is starting to slip. Considering, I bring up my experiment from earlier. “You did not hear me back then, did you?” I ask. His secret revealed, the expression upon his face goes sour. “Not that it’s your business, but I’ll be hearing fine again soon. Once this thing finishes healing,” he says, tapping the spot where his right ear is. This makes me start to chuckle, as an itch forms on the top of my breast. “Hey, I said not to laugh!” He says, looking offended. Without moving, he sits there for several minutes, just looking at me. I do my best to ignore him, focusing on my own piece. After at least two minutes, his brush starts to move again, yet the silence continues. I try and not look at him, but find my eyes drifting a few times, to adjust details. Oddly, whenever I glance up, I notice that he is looking at me under half closed eyes while his brush moves over the paper. His eyes, almost whistful. “What did you say,” he interjects after several minutes, catching me off guard. “I will not!” I insist. This just makes him smirk. He picks up the paper again, takes a moment to sharpen the tip of his brush with a simple wrist roll along the edge of the inkwell, and return to his painting. When I see that he finally turns away, I take the moment to stick my tongue out at him. “I saw that,” he says, eyes flicking to me quickly before returning to his work. As the time comes to a close, I finish up the shading and step back. While it’s not a particularly good piece, it is recognizable as Takashi. Why is he doing it and not the club president? “Could you take my drawing to the teacher too?” she asks. “Certainly,” I say, walking over and picking up Rin’s portrait. Her partner has already rushed off I note in the back of my mind. With a glance it is clear the level of skill difference between the two of us. While my shading is very primitive, she has made it expressive. I can see the boredom clearly on that brown haired boy’s face. “You did a very good job,” I say. Rin does not respond. She may not have heard me, or considered it unimportant. “Hurry up you four,” the teacher says. Looking over, I see Saki and Rika standing by the doorway waiting. I pick up our drawings and take them to the teachers desk. On top, clearly what is Takashi’s picture sits. For a brief moment, I consider what he’s painted. I set down the pictures I am holding on the desk, being careful not to smear anything. Glancing, the teacher isn’t even looking in my direction. Good. Taking the opportunity, I pick up Takashi’s drawing and consider it a bit. He captured my face well, but changed my clothing into a kimono. He even drew my hair in a very traditional style, different from the braid I have in right now. And while I kept a neutral, polite expression when I posed, he somehow turned that into a genuine smile in my face. Reluctantly, I have to be impressed. No, he didn’t capture my face well. He enhanced it, just slightly. Little flaws I try and hide, all missing. He made an idealized version of my face. Is this how he views me? The kimono even flows over me how a real one does. He had to be well aware of my body to do that, and then it hits me. Considering when I first saw him, maybe I was too quick to judge what was going through his mind while staring at me. “Come on,” the clearly bored voice of Rika says, dragging my awareness out of the image and into the world. I put the picture down, and head into the hallway with my hallmates. Interestingly, once in the hallway, I find no sign of Rin. Man that girl is fast. “It seems he behaved himself,” says Saki, stepping in aside me, the slight thunk of her cane telling me that she’s had a rough day. I chuckle slightly as one thought hits me. “At least the boy has some taste.” Relaxing a bit, I continue. “I have to admit, it was interesting. Painting someone is not exactly what I’m used to,” I respond. We walk along, chatting informally the whole way. I try and keep Takashi out of my mind, but the picture he drew keeps popping up. Why did he draw me that way? Today, Suzu made us krokkes, very tasty. Eating in Rika’s room, as per usual, it is the usual nice atmosphere, relaxed and joyful as girlfriends chat about the day’s events. Gathered around the table, I sit back after the meal is finished to relax. The question brings a slight smile to my face. “I suppose I am,” I tell her in all honesty. I truly am settling in it seems. “After she… died?” I say, not really understanding what was just said. A girl died. The girl who was in my room, the room I sleep in, died. This beings out a laugh from Suzu. “If you’re weirded out by that, you can’t go in most of the rooms for the school.” She takes a drink. “Or by the main gate…” she adds, a bit of a melancholy crossing her face. “I… didn’t know,” I say, dumbfounded. Dinner falls into a somewhat unsettling silence as I process all of this. Saki, dying? She’s my age. I couldn’t imagine… But what nearly happened to me? Without Hisao’s quick actions, I may have been already dead. And a dreaded thought I’d been trying to forget sinks in. I owe him my life, don’t I? As we finish dinner, I push my own dark thoughts aside by dwelling on the studying I still need to do. When Saki puts a hand on my shoulder, it surprises me. “And how far are you?” comes Suzu’s voice from her position, slightly muffled. With a glance I find her head is resting on her arms, as if she was preparing to take a nap. “Far enough that my mother has a tutor coming on weekends to help me catch up,” I say, finally leaning back against the wall behind me at the table. At this, Suzu’s eyes squint slightly, as some thoughts cross her face. Making a decision a moment later, she starts standing up. “To get Miki,” the cerulean haired girl says, straightening out her skirt. “Because you’re not the only one who needs help catching up,” she says, heading to the door. Sitting there, I can only smile. “It makes sense to me.” In the back of my mind, a bit more relief settles in. Someone else studying with me means less time alone with Hisao. “Well, there’s the track meet this Sunday too,” Miki says, a look of caution on her face. The mischievous smile on Suzu’s face tells me that she’s plotted all of this out, with just the right carrot for Miki. “Perfect,” Suzu says, sitting back down and clapping her hands once. “Now, if you’ll excuse me you two, I need to get to finishing up my own classwork,” I tell the group, standing up. “What classwork? We had a test today,” Miki says, confusion clear on her features. She clearly lacks a way to hide her feelings. Should challenge her to cards sometime. “Come on,” Suzu says, getting up as well and batting Miki’s shoulder. “What?” I ask, looking back at them. Miki looks as confused as I feel while she pulls herself to her feet. “Let’s help you, alright? It’s the least we can do,” Suzu says. My eyes slowly open, and I find myself facing a spotted black and white terror. Smiling, I kiss the thing and pull myself up off my bed. Checking the time, I am amazed to discover that for once I have slept past 6am. The digital face currently displaying 6:08 sits there all smug on my desk. Groaning, I crawl out of bed, walk over to my desk, and open my first pill bottle. Glancing across the floor, and the books still spread over it, last night comes to mind. We did not finally finish until curfew, much to the irritation of Miki. Sitting on my bed, the same spotted oddity sits, staring at me through button eyes. My morning pills done, I wander to the bathroom, turning on the light as I enter. Once inside, I stretch, letting out a soft groan, before turning to stare into the mirror. The memory of Maeda’s drawing drifts to mind as I look over my face. He did a good job in capturing my beauty. Then a look up to my hair, and I sigh. A disheveled mess sat on top of my head. First, inspect for changes, then brush. The mental image of me with Rika’s haircut causes me to shudder. “Appearances must be kept up,” I tell my reflection, mirroring the words my mother recited to me daily as a child. Maybe I should look for a wig that matches my hair as it is now. Or keep the hairs I brush out and have one made, if not just cut most of it off now, so I can have a wig of my own hair. Shaking my head, I dismiss that thought. It is still my hair, attached to my head, and there it will stay. I’ll… just have to consider my options when the time comes. That is when I spot it, another group of gray hairs, only barely visible above my left ear. Turning, I find a similar group above my right. Not even fully gray, just at the roots, only a few millimeters, but clearly there. Rika’s voice is finally what brings me out of my thoughts. “Iwanako, what’s wrong?” she says, alarm in her voice as she charges up. Scooting herself up onto the counter, Rika gestures to the stool next to the sink. Following her instructions, I sit down and tilt my head, following her instructions as she tells me to turn my head every which way. Hair is strange. We braid it, dye it, style it, it stands out as the largest expression of identity and beauty. Yet for all of its presentation, when another person interacts with ones hair, it is a very intimate thing. The gentle motions can tickle, comfort, or even in the right circumstances, arouse. Now, I know Rika clearly can’t mean to have done so, but the last one was certainly hitting me at that moment. It does, however, help relax my nerves. What? Keep calm. Keep calm. “Oh! Sorry, all… nervous,” I explain, trying to hide my embarrassment. “A week ago Sunday,” I tell her, a slight shudder as I remember the scene. Rika closes her eyes, and seemingly is doing some math, her braid in her hands as she plays with it. Looking closer, it strikes me that the braid is slightly a different shade from the rest of her head. Before I can ask if she can show me, I remember, tutor this weekend. I can’t go into the city to see about matching. The thought makes me shudder. Not going white, but shaving my head. A loud memory in pink hits me. Rika seems to get the same thought, as her eyes go wide. Remembering her window last week, it takes no time to figure out that Misha’s room is 217 in the other dorm hallway. At 7, I hope it’s not too early as I knock. I sent Rika off to her morning swim with Saki. This I can handle on my own. Instantly I hear a few noises, something falling over, then something else hitting a wall maybe, and a moment later the door opens a tiny crack. It takes a second to recognize the form peeking out through the crack. It clearly is Misha, her hair color a clear giveaway. Oddly, on her face, a set of glasses sit in front of green eyes, which show surprise at seeing me. “Iwacchan, what are you doing here?” she asks through the crack. Her eyes narrow. Behind them, I could see a hundred emotions flash, worry, fear, and concern. Finally, she nods, saying “Wait here,” before closing the door. I lean against the wall, and try to ignore the few girls who walk past. The only one I recognize is Miki, who is busy yawning loudly while buttoning up her shirt and appears not to notice me. Those tanlines of hers really stand out against her skin from the open buttons at the top of that boys shirt she wears. At least she doesn’t use a clip-on tie. Those things are so tacky. A few minutes pass before the door opens. Glasses gone, eyes golden, and wearing her school uniform, freshly laundered I note from the smell of fabric softener, Misha looks more her usual self. “Okay Iwacchan, come in,” she says. Inside I find a rather ordinary room. I don’t know what I was expecting, but other than a vanity and a set of shelves displaying a surprising number of trophies, the room is rather plain. ‘I suppose only in relation to my own,’ I think to myself. My room is rather decked out compared even to my hallmates who have been in the same rooms for years. A wave of relief hits me. She’s not judging. Oh thank goodness. I almost let tears out, the relief is that physical. The fear of being judged was that strong. “So, what’s the plan?” she asks, bubbly personality setting in. This act of hers just underscored some odd thing in this whole conversation. Misha has not given a single one of her trademark ‘wahaha’ laughs this entire time. I’ll lose the hair I am proud of, but I’m losing it anyways. If I must lose it, I will lose it on my terms, and only my terms. Thankfully I haven’t showered this morning. You never dye clean hair or else the strands will become brittle. Iwanaga Nanako will not let random gray strands exist. She will not go salt and pepper. The blonde locks were a compromise, and that is no longer enough. I have to commit. “No, please, you don’t have to…” she protests. I stand up and point to her vanity, with the curling iron sitting there on it’s little wire rest, the glasses I saw earlier resting next to a contact lens case off to the side. As she moves to her desk reluctantly, I consider their presence a moment. Colored contacts and pink hair, she clearly is as guided by appearance as I am. I grab her brush and start working on the pink fibers, a smile crossing my face. This is nice. Then memory of earlier, with Rika hits, and a slight shiver hits me. “Everything okay,” Misha asks, clearly noticing. Her shoulders are trembling, but we haven’t even gotten to the curling iron. “Fine! Fine!” Misha quickly exclaims, her own body shivering slightly. She’s acting a bit strange, but, I’ve also only known her a week. I lean in to get the last bit of her front hair into shape. The closeness of our bodies strikes me as something unusual, but comforting. Glancing down, her eyes are closed, and the shivers seem to have vanished. I can kind of see her lips moving, but can’t make it out. Might just be my imagination. While I start in on the back half of her hair, she picks up the curling iron and starts to work on the hair I’d prepared. After I finish brushing, and Misha starts to undo her curing iron’s clamp, there is a knock at the door, a steady, irregular pattern. “OH! That’s Shicchan!” Misha exclaims, suddenly excited. “Can you let her in?” She passes the iron from one hand to the other while gesturing to the door. “Sure,” I say, and head over to the door. Opening the door, a look of surprise on Shizune’s face sets in, and doesn’t pass for a few moments, her eyes scanning me with mixed parts confusion and interest. I wave her into the room. As she comes in, she eyes me, then Misha, before smiling and leaning against the wall, clearly waiting for us to finish up. Walking back to Misha, it strikes me that with the curling iron she and Shizune cannot talk to each other. Looking down, I see that if one holds the curling iron from the front or side, it would change the way the ringlet hangs. Sighing I reach around her, taking the curling iron out of her hands. This makes Misha gasp in surprise. She looks down at my hands, now rather pressed against her well stuffed shirt, for a few moments before she looks up and starts to sign to Shizune. “G-good morning Shicchan,” she says while signing. Watching their hands move, I feel a little envious. To be able to communicate like that seems surreal to me, yet here are two girls my age doing it just fine. The conversation continues while I zone out, watching their hands. “No, Iwacchan was just asking for hair dye advice,” Misha says, her bubbly voice filled with a bit of pride. This makes me groan. ‘Gee thanks Misha for broadcasting my weakness,’ I think to myself. It seems she’s not translating for Shizune, so her speaking out loud is just habit I suppose. Hearing half of a conversation is really weird. But thank you for not telling her about my hair going gray. The question completely catches me off guard. “Er, what be great?” I reply in confusion. “Shicchan offered to help. The bathroom at the end of her hall is a lot larger than those in yours, so it would be a lot easier to do,” she says. Thirty seconds later, and I unclamp the curling iron and set it into it’s holder. A few motions with my hands, and Misha’s curls are just as they always are, long, extravagant, and full. “Well, no, but it’s not that important,” I say, trying to dismiss her. Misha looks back to Shizune, and the two of them exchange signs, this time in utter silence. ‘Uh oh,’ the warning comes too late to my brain, as both of them walk up and grab my arms, forcing me to sit down in front of the vanity, facing the mirror. “What are you doing?” I exclaim in surprise. “Your hair! Wahaha~!” Misha exclaims. Clearly she’s back to normal. A glance between the giggling pink haired girl, and the sharp eyed student council president, and I knew I had lost this contest before it ever began. I resign myself as the two get to work. Walking into the classroom behind the student council, it still feels weird. I haven’t had a princess braid in years. Admittedly, because I dislike having the back of my neck exposed. But, those two were so eager, I couldn’t say no. And the way they braided my hair hides the gray hairs, much to my relief. Glancing about the room, I see Takashi sitting there, his drawing pad out. I consider him a moment, and remember his drawing yesterday. Then I go over the talk with Saki last night, and come to a conclusion. Walking over to his desk, I wave a hand at the edge of his vision to catch his attention. Instead of responding immediately, he finishes the line he was on and sets down his pencil before looking up. When he does, the look of surprise on his face is quite genuine. “It’s nice,” he says simply, before picking up his pad of paper and returning to work. Not looking up at me, a lopsided grin stretches across his face. “So, what now?” His eyes finally do drift up to me as he finishes speaking. I take a few more breaths. “I am not sure. But, I wanted to apologize.” I turn in order to hurry over to my desk. Well, I don’t see the harm in it I suppose. It took until I sat back at my desk to realize he called me by my proper name. Thinking about it, the only time he has been given my name… is when I wrote it on the board. Misha’s eyes track me as I walk to my desk. “What did you talk with Takashi about?” she asks as I sit down, a sly smile on her face. Glancing away, I catch my reflection in the glass. Sitting there, looking at the girl in it, one of the last times I’ll see her it strikes me. Soon, my hair will be white, a thought which fills me with sadness. No, need to focus on today. Today, I’m having lunch with a boy. And that thought makes me smile. My beauty is not gone yet. The four chimes of lunchtime ring out, and the class comes to life all at once. I work slowly, watching as the boy who sits behind me passes by, and starts talking to the girl who sits in front of me. Not meaning to overhear them, I still pick up that he’s made lunch for her and some other friends. That’s nice of him. My own thoughts however linger on my lunch plans. A quick glance and I see Takashi waiting by the door. His eyes follow me as I cross the room. When I stop in front of him, he gives a little smile, such a slight thing it would be trivial to miss if not looking for it. “Last chance to back out,” comes the offer. A final opportunity for me to tell him off, something I suspect he expects from me. The light chuckle he gives makes me feel proud of how I look. “Come on,” he directs, heading away from the stairs, in the direction of the end of the hallway. Curious, I follow. I expect him to go into the art room, but he walks past it without even a glance. There are only a few more rooms down this way, and one of them has a doorway which is slightly ajar. He walks up to this, knocks, and steps in. Curious, I peek around the corner of the doorway, and find a small classroom, if that. It’s about half the size of our classroom if that. Inside I find a few chairs, a table, and an easel. Everything else is covered in duck cloth, that covered in paint splatters of all sorts. “What is this space?” I ask, looking around the otherwise drab room. “Spare clubroom. Nobody else uses it, so the art club does as a small studio. Sometimes I have lunch in here.” He sets his bag down next to one chair and pulls out a lunchbox. I sit across from him and pull out my own. Inside my bento, leftovers from last night. Suzu did an excellent job, and made far too much even after Miki raided it. Looking across to my lunch partner, he seems to have a noodle dish in his bento which smells quite good. Thai, I think, with the strong odor of peanuts carrying through the air. “So, how are you liking it here?” He is the first to break the silence. “I have to remind myself not to snap at people. It’s kind of tiring.” The long suffering expression on his face puts truth to what he’s saying. Finished with my statement, feeling a bit drained at having shared it, my eyes gaze at the floor between us. Here I am trying to forget why I’m here for a moment, and then I tell everything. To a boy who yesterday at this time I’d thought a pervert, I find myself opening up. It is a very odd feeling. When I hear his chair move slightly, my eyes drift back up. I find Takashi sitting back, looking at me behind those half-closed eyes, those penetrating, analytical eyes. Almost absentmindedly I gesture to the point over my left breast. “One is around here. And the other one is… here.” My hand moves to the other scar, almost automatically running over it. “Why?” I ask, genuine curiosity flooding my voice. “What about me?” I ask, not really liking this train of discussion. Already I can feel myself getting defensive, and I have to fight with myself not to snap at him that it is none of his business. But, I pried into his romantic history. To deny the same in return would be shameful of me. Closing my eyes, I fight off memories of that day in the snow, to little success. “Only tried once,” I manage to tell him, fighting a bit of shortness in breathing. In the back of my head, I can hear my own heartbeat as a slight twinge of panic floats just out of reach. I look away, feeling regretful over what happened. “I fainted. That is when they found this.” I tap my chest. “So, what happened with him?” Takashi asks, his previously fowl mood vanishing in an instant as a look of curiosity takes its place. “I broke things off with him in the hospital,” I tell him, not looking up. “And he just accepted that?” The question hangs in the air a moment. “All confused,” I admit, closing my eyes, fighting the conflicting feelings within me. “The important question is, do you like him?” he asks, a bit of an edge to his words. Sitting there, I chastise myself for letting my language slip. “What else does he like?” he asks, tenting his fingers as he watches me. For all of the time we spent together, we never really learned much about each other, did we? “Ok, what do you want to tell me?” I respond, trying to be polite. “Lost your… how does one lose their hearing?” I ask, taken aback. For a moment I consider his offer. Certainly, it feels good to have someone who wants to be around you. Someone who is there because they want to be, not out of some sense of obligation or guilt. But, this is bad timing. “Are you trying to ask me out? Because that is not going to work. Besides, I have to work on my hair tonight,” I say, amused at his blatant attempt to get to spend more time with me. “That old excuse? Come on, seriously,” he says, leaning back and folding his hands behind his head..
“I am serious. I have to dye my hair tonight…” I clam up as I realize what I let slip. “Dying it? Afraid of your roots showing?” he gestures to the area in front of his scalp where my two strips sit. “We take the same medication,” I tell him, leaning forward slightly. “She has been taking the medication for longer than I have,” I continue. “Ok, still not getting it,” he says, confusion remaining firmly in place. I take my two locks, and bounce them a moment. “I dyed the hair in front in order to match the roots,” I tell him in a bit of a sing song voice. “If my hair is going to go white, it is going white on my terms,” I tell him, feeling a sense of pride. With a precise motion, the brush dips itself into the ink, and he begins to work without a by your leave. “Are you seriously…” I start, completely taken aback by the presumptuousness of the boy. “Shh! Don’t move,” he interrupts sharply. The whole thing is so bizarre I play along, holding still, a polite smile affixed to my face. “Because I need to see your new hair. I can only get your face today,” he says, eyes not leaving the paper. He didn’t see my lips move, which means he simply knew my protest already. I laugh, an action which finally draws his attention away from the paper. “Clearly, you have never dyed your hair before,” I tell him. The only response Takashi gives is a raised eyebrow. His face scrunches up, as if considering that. After a few moments, his trademark smirk returns to his face. Clearly, he has something in mind. He thinks he is so devious. “Well I never said tomorrow. I may have a date for lunch tomorrow for all you know. Jumping to conclusions like that, what ever should I think?” The grin on his face is rather infuriating, even if cute. “I almost think you began this in order to get me to join you again,” I tell him, not entirely believing how blatantly he is acting. “Flatterer,” I say, feeling a bit of pride. ‘Most beautiful…’ the thought drifts in my mind a moment. I can feel my cheeks burning slightly as he returns his brush to the paper before him. ‘But if I am the second, who is the most?’ I wonder quietly to myself. “Alright Iwacchan, it is going to burn a bit the first time,” Misha says as her hand guides the brush it holds to the first strands. Next to her, Shizune and Rika both mimic her motion. Bracing myself, I am forced to remember that one must suffer for beauty. But even then, the burning sensation hits my scalp in short order. My hair sectioned into four portions, I can only sit there as the three girls go at it like mad artists to the canvas of my strands. Keep my eyes closed, I fight to not let myself get distracted. Last thing I need is to burn my scalp with the bleach. The smell of the bleach overwhelms my nose. This stuff seems particularly strong, judging by the odor. Oddly, it is not as painful as the bleach the salon used for my front bangs. What makes me wary is the knowledge that I need to sit through this four times before using a pastel, violet toner, to turn the bleached hair, which is yellow into the white my hair is naturally turning into. Beauty is pain. I must suffer, for I must be beautiful. No flaws but what I wish to be known. I have to present myself to the outside world this way. Ignoring the brush strokes, I consider my mother’s lessons. Lessons learning calligraphy, like how a “proper lady” should. Lessons on how to keep myself pretty for others. Lessons in how to speak and behave before others. Lessons that my value is in the children she expects me to have. My heart sinks at the memory. ‘Why am I bothering with this,’ I wonder for a moment before I shove it aside. Then the harshest lesson of all rears its ugly head, when I learned first hand how only girls who maintain their appearance matter. More than a few people questioned my friendship with Mai, her tomboyish nature clashing horribly with my own. But she was always there when I needed her, so I could not abandon her, even as the whispers about her grew stronger. Not the worst whispers in the school, but so many people questioned her, from her taste in clothes to her sexuality. Yet the girls I knew who did lean in that direction never had a single gossip travel through our school. They maintained their appearance, and as a result nobody gave them even the slightest mind. I can’t let weakness show. Not a single flaw will mar me. I am Iwanako. But, what about now? The me a few months ago would never have dyed her hair lighter at all, instead conforming to my peers. Why did I bleach my front locks? Because it was a new school, a new social order, one which I would be a stranger to. In other words, one which didn’t know me already, so I didn’t have an image to maintain. But now, 9 days in, why am doing this? Fear. Fear of gray hair at 17. A silver haired beauty I could manage. A salt and pepper haired old maid I could not. And worse still, if I dye it back to my original color, when my roots do show, my hair would slowly become damaged. Eventually I would need to cut it off if I tried it that way. I have no other choice in the end. The thought shakes me. I have to maintain my image. I have to. Focusing on the tingle on my scalp, a slight feeling of rebellion stirs. Maybe this will not change anything among my peers. I’m in a room with people who have scars, are missing limbs, and we’re all classmates. Will they ridicule my hair? And that thought terrifies me more than anything. My mother will freak, but I have time to get ready for that. And by the time she sees me again for summer break, it will be too late. That sad realization hurts more than anything. I’m doing this not because I want to, but because the alternative is unimaginable. I smile as the process begins again. The next rinse, the next brush, and I have to do this for three more days. ‘Never a flaw, never a mark, Nanako will always look her best.’ Only after the thought passes do I realize, I used my own name. Why did I use my own name? I never use my own name. ‘Because I liked hearing it when Takashi said it earlier,’ I think to myself, and a slight smile settles in. “Nanako,” I mumble, reminding myself of his words. “What, Iwachan?” Misha says, pausing mid-stroke and looking down at me. “Oh, nothing. Takashi calls me Nanako. It still is strange to me,” I tell them, lacking the time to come up with a better story. “Why haven’t you told him to stop?” Rika asks, still brushing. This makes Misha contemplate something… and the back of my mind starts to warn me of danger “Do you want me to call you Nanachan?” Misha asks, her face breaking into her trademark grin. “Oh! Please no! That is the same name for a statue down south. After my class had a field trip and saw it, the teasing became so bad that I began going by Iwanako,” I blurt out, nearly causing the three of them to lose their place. “Ok Iwacchan! Glad you approve. Wahaha~!” Misha laughs, her smile set in place as usual as she returns to brushing. The sound of Rika snickering at my elbow, struggling to contain herself, almost makes me start in as well with how infectious it is. As the final rinse is done, the odor of the bleach used hangs around like a gentle mist. Flowery, rather than the harsh chemicals used for my forward locks, this process is time consuming, but went smoothly I consider to myself. For a moment, I can’t recognize the girl in the mirror, as if I were staring into the face of a stranger. It was all as if something out of a romance novel. IMO 90% of all "like" in any given text could and should be replaced with "as if". This is not one of them. So, I must admit, despite the "end of Act 1" notice after the last chapter I didn't really expect this to be continued - mostly because the ending seemed quite... well, final. And that's also the biggest - if not only - problem I have with this 2nd act: In the final scenes of act 1 there was only bliss between Hisao and Iwanako, not a single hint that anything might be wrong, and even her "I can't tell you yes right now" was as if it was only a matter of time. Now I don't mind that the story seems to continue in another direction, because as I said after act 1 I wasn't a huge fan of that quite sudden "happy end", but putting some more indication of those doubts in the final act 1 chapter would probably have improved both that and this part. I like it, a lot. Looking forward to where this goes.